Accepta 2061 is a high-performance DEHA based oxygen scavenger scientifically formulated to deliver outstanding protection from oxygen corrosion together with effective feed water and boiler system passivation. Accepta 2061 can also be used as a replacement for hydrazine. Accepta 2061 may be used in boilers at up to 125 bar, eliminating most of the safety hazards and handling precautions associated with the use of hydrazine. Accepta 2061 is a DEHA based oxygen scavenger; it is volatile and alkaline, contributing no dissolved solids or ammonia to the system, and can be fed into feedwaters used for spray at temperation. 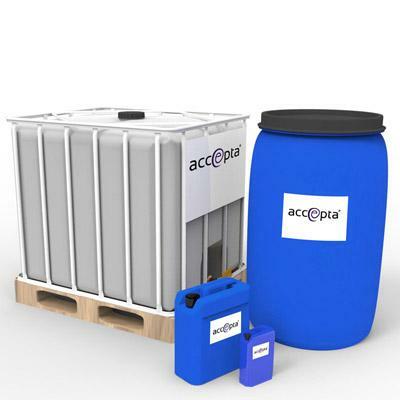 Accepta 2061 is not suitable for use with highly oxygenated feed waters – a minimum feed temperature of 85oC is essential and de-aeration is preferred. Accepta 2061 is highly effective as a corrosion inhibitor for closed systems where minimal addition to the non-volatile dissolved solids in the system water is necessary due to high operating temperatures and pressures or to operational conductivity restrictions. Lower corrosion rates from passivation, translates directly into lower maintenance costs and reduced downtime. The combination of this product and polymer programmes provide exceptionally passivated boiler internals. For a typical 40 barg [600 psig] boiler using 5.5 kT.day-1 [12.106 lb.day-1] of feedwater that is conductivity limited, the savings in energy and water costs by using this product, versus liquid sulphite, can be high. The Return On Investment from using this product in place of liquid sulphite may be over 600% while only slightly raising the chemical costs. Highly effective DEHA based corrosion inhibitor for closed systems. Suitable for boilers at up to 125 bar, eliminating many safety hazards and handling precautions associated with the use of hydrazine. Reduces system maintenance costs and minimises downtime. Significant savings in energy and water costs. Contributes no dissolved solids or ammonia to the system. Accepta 2061 should be fed neat. Diluting oxygen scavengers will cause loss of oxygen-scavenging ability. Diluted solutions of Accepta 2061 may not be stable. Feed Accepta 2061 continuously. Any interruption in feed will result in corrosion in the feedwater system and possible pitting failure in the boiler. Never permit less than a 0.25 ppm DEHA residual to be present at any time. To ensure consistent and adequate chemical feed, the pump speed should be set as high as possible and the pump stroke should be set as short as reliably possible. Accepta 2061 cannot be mixed with any other chemicals. Chemical additions to the formulation will result in extreme loss of oxygen-scavenging ability. Feed Accepta 2061 to the storage section of the de-aerator below the water line via an injector. Accepta 2061 is compatible with most other internal boiler treatment programmes. Total product dose is based on the sum of that required to react with the dissolved oxygen plus that required to establish a residual in the feedwater. The product should not be diluted or mixed with other treatments. It should be injected into the feedline close to the hotwell or to the de-aerator storage section using a dosing pump set for high frequency/low stroke volume to maximise continuity of dosing. The residual range for Accepta 2061 should be controlled between 8 and 12 ppm as product in the feedwater. Accepta 2061 test is a feedwater control test and is not applicable to blowdown samples. The residual in closed systems can be from 10 – 50 ppm depending on the system parameters. The residual range for Accepta 2061 should be controlled between 8 and 12 ppm as product in the feedwater. The product test is a feed water control test and is not applicable to blowdown samples.